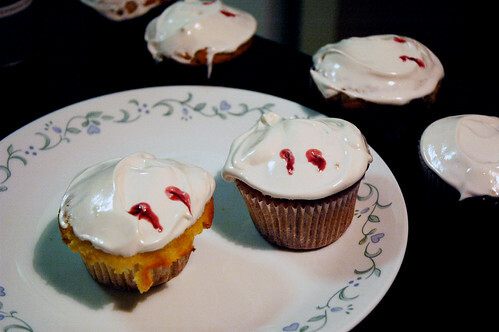 Vampire Cupcakes – o frabjous day! 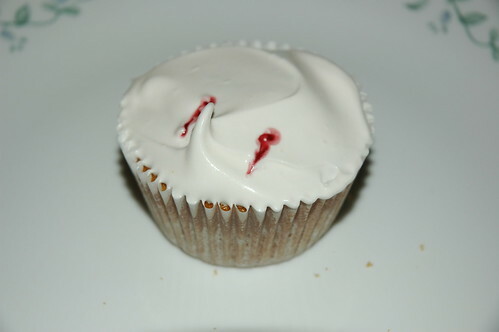 I saw these cupcakes at Baking Bites, and couldn’t resist them – the fabulous bleeding vampire bites in the soft white icing. They were rather fiddly (as you might guess from the long list of instructions), especially making a big batch, and the icing takes quite some time. Admittedly, it’s all time spent standing still holding an electric beater, so it’s not overly taxing, but I spent it fretting that the icing wouldn’t solidify, which made it seem rather longer. Preheat the oven to 180C/350F (350F is probably more like 175C, I think, but 180C works fine). Pop your paper liners in muffin tins. Nicole at Baking Bites says to sift the flour, baking powder, baking soda and salt together into the bowl of a food processor, but I’m lazy and didn’t bother. I hate sifting. If you’re following my method, dump those dry ingredients into the food processor (with some sort of plastic paddle-like attachment) and give them a whiz. Add the sugar, and blend again. (Or just mix it all up in a bowl by hand, I suppose). Cut the butter into chunks, and drop it into the food processor – mix on low speed until it looks sandy and no large chunks of butter remain (for about 1-2 minutes). Put the egg whites, buttermilk (or milk soured with a little light vinegar), vanilla and almond extracts into a bowl, and whisk together. Pour roughly half of the liquid mixture (or about 1 cup) into the food processor, turn it up to medium and beat for about 1 ½ minutes. Reduce the speed to low, and pour in the rest of the liquid, beating for about 30 seconds until it’s all well incorporated. Divide evenly into prepared muffin tins – I overfilled some of mine, and have decided that about three quarters full is best, as they will then rise evenly to the top of the muffin case. Puree a mix in a blender of mostly cherries, a splosh of the syrup, and a few tablespoons of jam. You should get quite a liquid mixture that has a bit of body (how vague!). Whisk sugar, egg whites, water, golden syrup, and cream of tartar in a large metal bowl. Set the bowl over a small saucepan of barely simmering water (so that the bottom of bowl doesn’t touch the water). Using handheld electric beaters, beat on medium speed until mixture resembles soft marshmallow fluff, about 5-7 minutes. (This feels like forever, and you wonder if it’s ever going to thicken. It does.) Increase mixer speed to high and beat until mixture is very smooth and thick, about 3 minutes longer. Remove bowl from over the saucepan. Add vanilla extract and continue beating until marshmallow icing is completely cool, about 5-7 minutes longer. It should be fairly thick, a nice spreadable consistency. Ice each cupcake with a layer of the cooled marshmallow icing by swirling it about with a thick knife. Dip a wooden skewer into some leftover filling and poke two fang-holes in the frosting on one side of the cupcake. Dribble a little extra filling from the holes for effect. Repeat until all cupcakes are iced and decorated. I had heaps of icing left over and quite a lot of filling, probably plenty for another batch of cupcakes. Those are great! I’ve never seen anything like them. Alas, I discovered these cupcakes a little too late to make in time for Halloween, but they’re a good thing to keep in mind. I have some zombie-loving friends who would get a kick out of them.